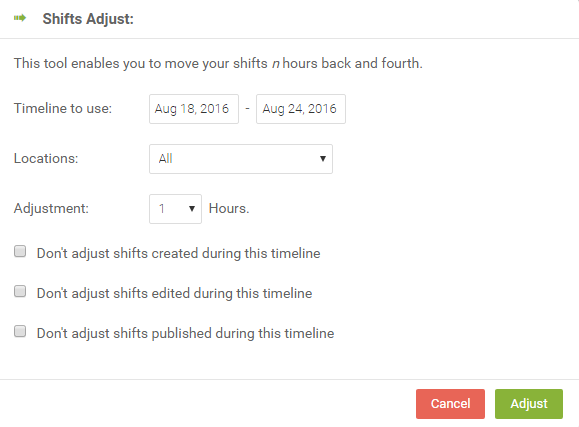 The 'Shifts Adjust' feature enables you to move your shifts by 'Location' up to 12 hours back or up to 12 hours forward in the selected timeline. By default it will move all shifts present in the timeline. The options will only affect the shifts that were actually created, edited or published on those 'dates' and not those shifts that were 'originally' created, edited or published on another date relative to today's date. For example: say you have the option 'Don't adjust shifts edited during this 'timeframe' checked. Thus if your timeline is the 14th - 20th 'and today is the 15th' and you edit a shift to the 16th, it will not move it. However, 'if today is the 9th' and you edit a shift to the 16th, it will move it - as it was not actually edited on those same 'dates' relative to today's date. Here it will adjust all shifts except those that were created during this timeline relative to today's date. Here it will adjust all shifts except those that were edited during this timeline relative to today's date. Here it will adjust all shifts except those that were published during this timeline relative to today's date.